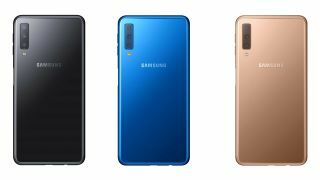 Samsung has taken the wrapper off of its latest phone which has a big USP for any budding smartphone photographers: the Samsung Galaxy A7 has been given three rear cameras. Following in the photographic footsteps of the Huawei P20 Pro, the first phone to have this setup, the Samsung Galaxy A7 is being positioned as a phone for those who love to take pictures, complete with some bold claims. The first is that the Galaxy A7’s 8MP (F/2.4)120-degree Ultra Wide Lens has the same viewing angle as the human eye, meaning the "Galaxy A7 captures the world exactly as you see it". There's also a 24MP lens on board and something called a Depth Lens (5MP / F/2.2). The 24MP Lens is for low-light conditions and will "automatically lets more light in by combining four pixels into one pixel" - there's not a good deal of clarity how this actually works but it certainly sounds impressive. These lenses are coupled with some software enhancements, including intelligent Scene Optimizer. This is a little like the AI seen on Honor and Huawei handsets where it categorises the subject you are taking a picture of and adjusts the colour, contrast and brightness to improve the image quality. If three rear cameras weren't enough, there's also a 24MP ((F/2.0) front camera that comes with an adjustable LED flash. Another big boast is that this will be able to take selfies that mimic professional studio lighting with Pro Lighting Mode. There's also the en vogue bokeh effect available and you can also use AR emojis with the phone. When it comes to non-photographic specs, there a 6.0-inch Super AMOLED display, Octa Core 2.2GHz chipset, 4GB RAM, 64 Internal Storage+MicroSD Slot (Up to 512GB) and it runs Android 8.0. The Galaxy A7 will be available in the UK this autumn with price TBC. We'll hopefully get our hands on the device soon to see if its camera performance matches what we saw by Apple in our iPhone XS camera review.